Why is Santana Playing in my Head? Another great find in the 2014 plant catalogs! This time it’s DRUNKEN WOMAN FRIZZY HEADED LETTUCE, sold by Territorial Seed Company. Gotta have it… then this summa I’m gonna crank up some Santana, swing those (svelte) hips, and belt out a new tune in my garden: “…I got a frizzy heada lettuce, got a frizzy heada lettuce, got me so blind I can’t eat, it’s tryin to make a meat eater outa me…Got its spell on me baby…I need you so bad, drunken lettuce, I can’t leave you alone…”. And the catalog even adds, “It’s the last lettuce to bolt”. Well, of course she is! She might be drunk and frizzy headed, but she’ll never bolt from ya, baby. And, no, I haven’t been to Colorado lately. 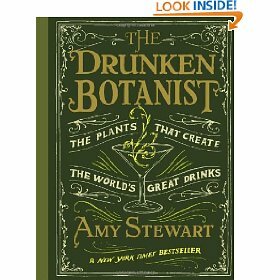 BUT this reminds me that a fine and noble Weedpatch reader, Patti S, sent me a wonderful book: The Drunken Botanist: The Plants That Create the World’s Great Drinks by Amy Stewart, who also wrote, Wicked Plants:The Weed That Killed Lincoln’s Mother and Other Botanical Atrocities. My kind of author! Wonder what lettuce she’s planting in 2014? It seems a bit early for lettuce this dark, cold morning; but I am from Colorado—-so all things are possible. We grew lettuce in our huge garden at my parent’s farm (my Mom still has) and it may have been frizzy?? Thanks for the laugh with my coffee—a great way to start the day!!! I love Territorial Seed Company, they bought out my friend’s Grandma’s Garden company. So glad their good reputation is growing with the lettuce!